NOTE: The warning chime may sound and the FCW indicator may blink when the distance sensor detects vehicles in other lanes A or objects on the side of the road A . This may cause the FCW system to operate inappropriately. 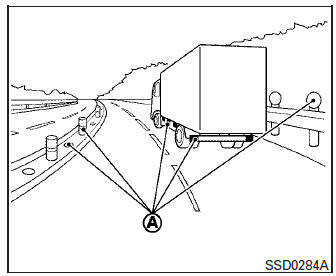 The distance sensor may detect these objects when the vehicle is driven on winding roads, narrow roads, hilly roads, or when entering or exiting a curve. Also, the sensor sensitivity can be affected by vehicle operation (steering maneuver or driving position in the lane) or traffic or vehicle condition (for example, if a vehicle is being driven with some damage).